Russia’s most popular beer is a type that has long been lost in Europe and survives only in Mexico. For nearly a century, the most popular beer in Russia has been Zhigulevskoye, which was first brewed in Samara, a city on the Volga. Despite its mass availability and Soviet image, this beverage is directly related to the Mexican brands Dos Equis and Negra Modelo, which are popular among clubbers the world over. Samara’s Zhigulevskoye brewery was opened in 1880 by Alfred Josef Marie Ritter von Vacano, an Austrian nobleman of Hungarian-German origins. Von Vacano proved to be an outstanding brewer and brilliant businessman. After a few years, the small, half-dead brewery that had fallen into his hands became the top factory in Russia, even ahead of Western ones. The factory boasted its own power station and electric refrigerators, which were still rare at the time, railroad and river transport, and strict hygiene standards. As befit an Austrian, under all his pragmatism the immigrant businessman was sentimental and romantic: He named his brainchild after the Zhiguli hills — a picturesque Volga site connected with Stenka Razin, a sort of Russian Robin Hood. The plant brewed several types of beer, but the local Vienna lager enjoyed particular popularity; this is a variety of beer that is now nearly forgotten in Europe. Vienna lager resembles the well-known Pilsner lager (made from light malt and matured cold under so-called bottom fermentation), but it is more stable and has a richer color, ranging from amber to red, and a strong hop bitterness. Toward the end of the century, von Vacano’s beer was not only being served in all the best restaurants in the wealthy Volga region, but it was also being exported. The beer’s superb taste came from the high quality of the raw materials, strict production standards and the famous Volga water, which is celebrated for its taste and was still clean at the time. It so happened that the Soviet authorities could not destroy the life’s work of the Austrian, who had received Russian citizenship at the turn of the century. The Bolsheviks seized the factory from the foreigner and sent him to die in destitution in his homeland, but they kept the factory’s culture. In the early 1930s, Anastas Mikoyan, Stalin’s minister of food production, visited the brewery, approved of the beer’s taste and the work of the “Viennese man,” but ordered that the beer’s “bourgeois” name be changed. The decision was a quick one: rename the beer after the factory. Thus the acclaimed “Zhigulevskoye” was born. Soon the Zhigulevskoye recipe became the standard for the entire country. Beer with this name was brewed in the Soviet Union in more than 700 places. Several hundred breweries throughout the former Soviet Union continue to make it now, but there is only one true Zhigulevskoye — the one that is produced at the Zhigulevskoye brewery. 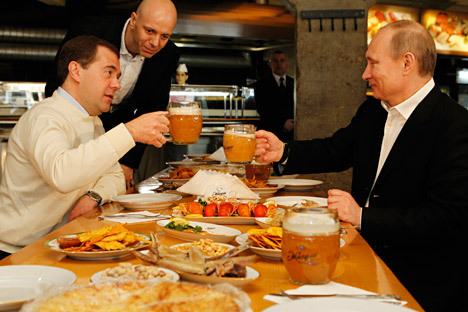 Two facts attest to the quality of this beverage: in Moscow it is served in only a few restaurants, and although this brand is inherently inexpensive and democratic, it is worth as much as exported English ale. Genuine Zhigulevskoye cannot be transported in bottles — it is a “live,” unpasteurized beer. So where does Mexico enter the story? When von Vacano fled from Russia to Austria, a few Austrian brewers were escaping Europe’s famine and going to Mexico, where they started to locally produce Vienna lager — the subsequently renowned Dos Equis and Negra Moledo. It is regrettable that this type of beer died out in Austria in the 20th century. Even at the brewery where it was invented, Pilsner is now brewed. The beer has survived only in Russia and Mexico. Incidentally, Russians consider Zhigulevskoye to be a more genuine Vienna lager than the Mexican Vienna lager. Zhigulevskoye, like its ancestor, is brewed from bitter European hops, not the sweeter American ones.